One of the most popular cymbal manufacturers in the world is Sabian; and with so many types of cymbals, it is no wonder why. 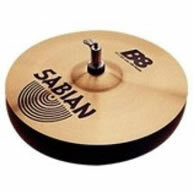 Sabian has a wide array of cymbals ranging from high quality hand hammered, to lower end machined cymbals. The B8 model comes in a pack of 3 cymbals, a set of hi hats, a crash, and a ride cymbal a very good idea for the beginning drummer, having everything in one pack. But is this pack worth spending the cash on? Or are you better of buying individual cymbals. I went out and purchased a set of B8’s and tested them out – here’s what I have to say. As for looks, Sabian delivers! The cymbals themselves are very clean and shiny looking. They look like professional sounding cymbals that can be easily mistaken for higher end quality. The best part about buying the B8 pack, is the whole set comes in a cymbal carrying case. This is a huge plus to the pack, as having a carrying case for your cymbals is very good thing to have. This case brings the whole package together, making you feel a lot better about owning a “cymbal pack”. The hi hats were the first ones I played around with. The first thing I noticed was how bright of a sound they offered. For a cheaper line of cymbals I never expected them to be as bright as they were! Playing them closed sounded very nice, great for performances. When I played these half open, to get that sloshy feel, I noticed the sound was not as bad as I had anticipated it would be. Sabian did a great job in making a loud projective set of hi hats for a decent price! However, getting a clean bell sound, or fully opened sound from these hats was tuff. I found the sound was a little tinny, and cheap. 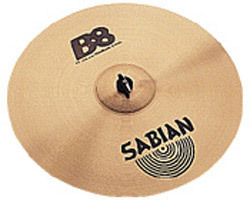 All in all, the Sabian B8 hi hats were a great bang for your buck, offering decent sound for a decent price. The crash cymbal was next on the chopping block. The sound this cymbal produce was far from ear piercing. This cymbal was surprisingly warm. Cheaper cymbals tend to have very little warmth and sound tinny. However, the B8 crash offered much more personality to its sound. The cymbal itself was rather thick, meaning two things. One, it will not crack very easily, which is a great quality for beginner drummers. Two, it will carry its sound for a long time. This can be an advantage, and a disadvantage. Personally, I wasn’t impressed with the amount it held its ring, especially for a 16 inch crash. Overall, the B8 crash has a decent sound for the price. The ride cymbal has always been one of my favorite cymbals, so reviewing this was a treat. The first thing I noticed about this ride was the thickness and weight of it. It was a little heavy to be carrying around much, and the thickness gave it a long lasting sound. 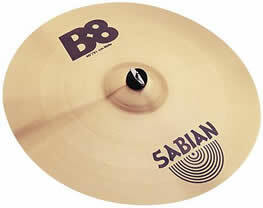 Either than that, this cymbal was right on par with the other two B8’s I tested. The cymbal was very bright, which is perfect for a ride cymbal. The best part about the B8 ride was its’ bell, which sounded very nice. Out of all the B8 cymbals in the pack, the ride was by far the best! 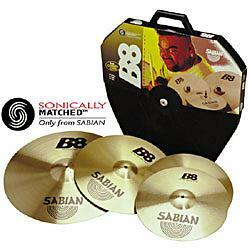 In conclusion, the Sabian B8 cymbal pack is an ideal bargain for its price. You can pick one of these up for 150-250$ depending on where you go. This is a steal considering you get 3 cymbals and a carrying hard case. Anyone looking at buying individual cymbals will spend that on each cymbal, so this is a great package. Although the cymbals are not the best quality, they have a great look, and a decent sound. For beginner drummers with a budget, this is the pack for you!